Okays, Mr. Grinch, we've done ther fakes reindeers thing. So let's take a bites outta Whoville and go homes. I'm not saying all catfish are shifty, but this guy... well, you want to stay away from him. He is trouble. Big, big trouble. If you’re thinking of opening your home to a new pet there may be no better time than right now, because various animal shelters across the country are offering discounts on adoptions for pets. The Green Cat returns! 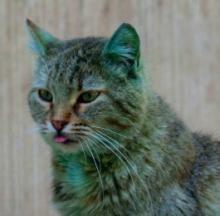 Last year images of a Bulgarian street cat with bizarre bilious green fur went viral on the 'net, sparking equal measures of surprise and concern among cat-lovers worldwide. There is something about using a computer keyboard that can really leave your hands cold when winter sets in. Shhhhhh! Be vewy, vewy quiet! I is hunting Christmas elveses. We all know how cats love boxes, but this little boxing/wrestling ring is a perfect spot for your felines to rumble!